Medical Microbiology: Does Toxoplasma drive you crazy? Does Toxoplasma drive you crazy? A couple of times I have talked about if a microbe can influence the Neurochemistry. I have made my points clear as this can be possible in my previous post. I got a couple of comments as to why I have not talked about Toxoplasmosis in this context. So let me elaborate on the issue and consider this as a sequel to my previous post on schizophrenia (Read my previous post here). There has been a lot of debate on this issue and press releases have sometimes hyped the scene. There are facts known in the science world, that serve as examples of how one species can entirely manipulate the other as demonstrated by Ed Yong in a TED talk (Link). "Scientists are still trying to understand the behavioral changes - if any - in humans infected with toxoplasma, but research has so far linked it to worse reaction times, a more than two-fold increase in the risk of being involved in a car accident, suicide in women and schizophrenia". I usually say this sentence to begin with in my lectures. "Toxoplasma is a kind of marvel pathogen. It can infect everything which is warm blooded (so goes the saying) and it can be as silent as non existent in a system". Fig 1: Ultra structure of Toxoplasma. Here's an important point. In the life cycle asexual part of development happens in the mammals. In this case, mice infected with toxoplasma. It so happens that mice looses the fear of cats and will wander in its territory allowing the cat to grab the mice. And the parasite gets to continue its life cycle in the cat which repeats. The phenomenon is the same in wild, where the felines and mammals form part of the cycle. It was thought that this suicidal behavior is what is seen in humans having latent toxoplasma infection. Or is it? Let's get a little deeper. What is the mechanism of mice loosing the fear of cat. Mice that have been infected with toxoplasma, will loose the fear of the cat, and this behavior persists even after the infection is gone for months. Its a permanent change. As Eisen puts it (Source) "Long after we lose the ability to see it in the brain, we still see its behavioral effect". This is because of the following. Prey in general, detect the presence of a hunter by smell especially from urine. This is achieved by olfactory recpetors called as trace amine-associated receptors (TAARs). It is proposed that the receptors are somehow damaged of their effects. No smell, no fear. This is a very clean explanation. From evolutionary point of view, it is important for the parasite since continuation of its sexual life cycle requires that it move to the felines. But what about we humans? We don't depend too much on our smell to recognize situation. So what causes the human behavioral change. A good deal of possibility is that parasite in brain can elicit immune response, and certain types of immune response especially certain interleukin can influence behavior change. This is a subject of investigation in the field of psychoneuroimmunology of schizophrenia. But there appears to be a growing evidence of second possibility. Micro RNA or in short miRNA are short stretches of non coding RNA of about 22 nt in length. They are an integral part of regulation in the RNA world, and are usually involved in fine tuning of cellular machinery. a cyclic AMP-responsive element binding (CREB)-regulated miRNA. miR-132 is known to have a regulatory role in the dopmaine regulation. A recent publication has shown that toxoplasma strains consistently up regulated the miR-132 and is associated with changes in dopamine receptor signaling. That calls for some attention, since schizophrenia has a known link with miR132. As a matter of fact there are 2 hypothesis for schizophrenia- Glutamate and Dopamine hypothesis. The dopamine hypothesis is depicted in Fig 2. This concept raises an important question. 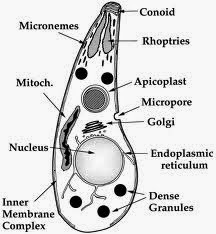 How does toxoplasma gain anything from an evolutionary perspective. In other words, why does toxoplasma still have this trait if at all the explanation is true for schizophrenia. The answer probably lies that we are asking the wrong question. As Vincent explains (Link) in his blog, virulence maybe a parallel property and not directly related to life cycle. The pathogen has it cause it is a side effect of some mechanism rather than toxoplasma itself is interested in people having suicidal tendencies and schizophrenia. 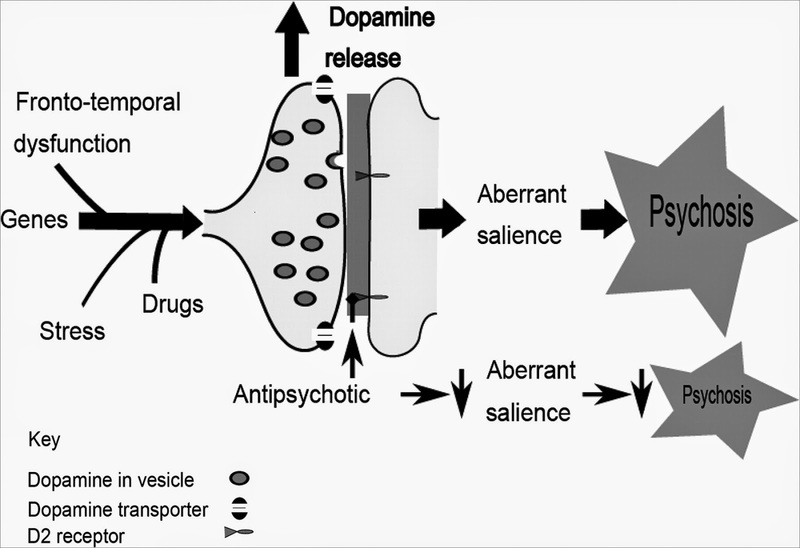 So where does the collateral explanation for dopamine comes from? It should be noted that the toxoplasma has two genes for the enzyme tyrosine hydroxylase, the key enzyme for synthesis of dopamine, and bradyzoites express these enzymes and release dopamine into surrounding tissue. Dopamine release into surrounding tissue is important for toxoplasma, probably by helping it to progress with tachyzoite production, as suggested by Strobl etal. As per the literature, I can sum up few possibilities of how a pathogen can get your neurochemitsry to work different. First organisms can directly interfere with signalling mechanisms such as toxoplasma effects on mir-132, Gut flora interfering with microbiota–gut–brain axis etc. Second, the organism may illicit a cross reactive antibody such as in the case of Group-A Beta-Hemolytic Streptococcus pyogenes causing ABGA (Anti basal ganglia antibodies) or production of cytokines which impacts through hypothalamic-pituitary-adrenal axis which is the seat of integrating endocrine, immune and cytokine pathways with neural signalling.